I know it sounds cheap. Giving someone a used item as a gift? I have the image in my head of opening a stained blanket or a broken coffee mug and pretending to be excited. That’s not what I mean... 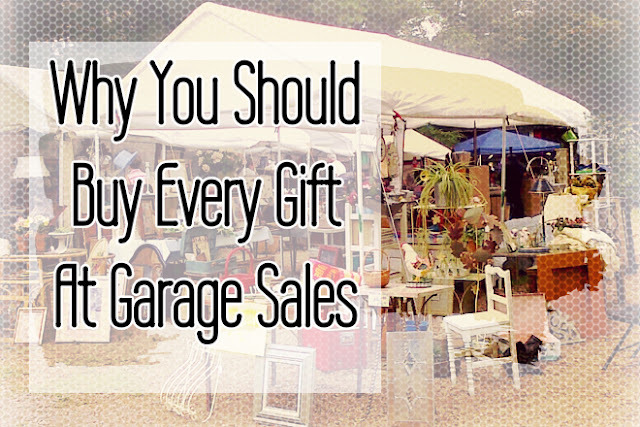 Here are a couple of ways to buy items at garage sales that can be given as gifts. 1. Look all year long. I don’t wait till Christmas to buy gifts. It’s May and I already have about 10 gifts in my closet. That way, you’re never in a bind to buy gifts at the last minute and forced to buy something that “works” instead of something they’ll love! 2. A gift that reminded you of them is so much more special. I would rather be given something thoughtful than another scented candle (but, for real, don’t stop buying me candles). I love to buy things for people that have a special meaning. When I see a set of vintage Pyrex or old books, I immediately think of my sister-in-law, so I scoop up things like that all year! When I see a unique art piece, I love to buy it for my mother-in-law. It’s so special when they unwrap it and you tell them how you found it and how it reminded you of them. Talk about a meaningful gift! 3. Look for things that still have the tags or that are in good shape. Yes, some people will like rusty, antique junk (this girl), but the majority of people will want something new or like new. I would never give someone something that isn’t antique store quality! So if it has chips, cracks, or scratches, keep searching. 4. Yes, it’s cheaper! Many pieces would’ve cost me twice or three times as much had I bought them at a store. So I get more for my money and they get a better gift! I could go to Target and spend $50 on a nice mirror, or I could spend $4 and get something gorgeous, antique, and taylored to the taste of my loved one! So start stocking up now! Not sure what to buy? 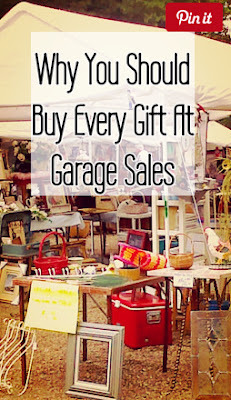 Check out 10 Items to Look For At Garage Sales (and what you should pay for them). Happy hunting! I like to have a few gifts on hand and definitely prefer to pick up things when I see something that would be meaningful or special to the receiver. I honestly have never thought about buying a gift at a garage sale, have to look at things differently the next time we go snooping!